Well, I’ve been on Ebay again. 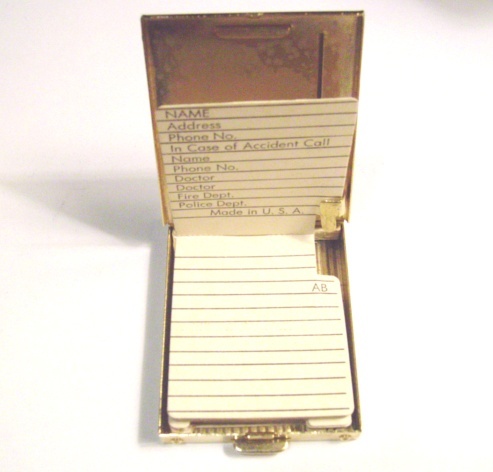 And look what I found…this is a tee-ninsy woman’s address book – just 1 3/4″ by 2 1/2″. It literally fits in the palm of my hand and is so shiny/classy I almost feel like a dimestore starlet. 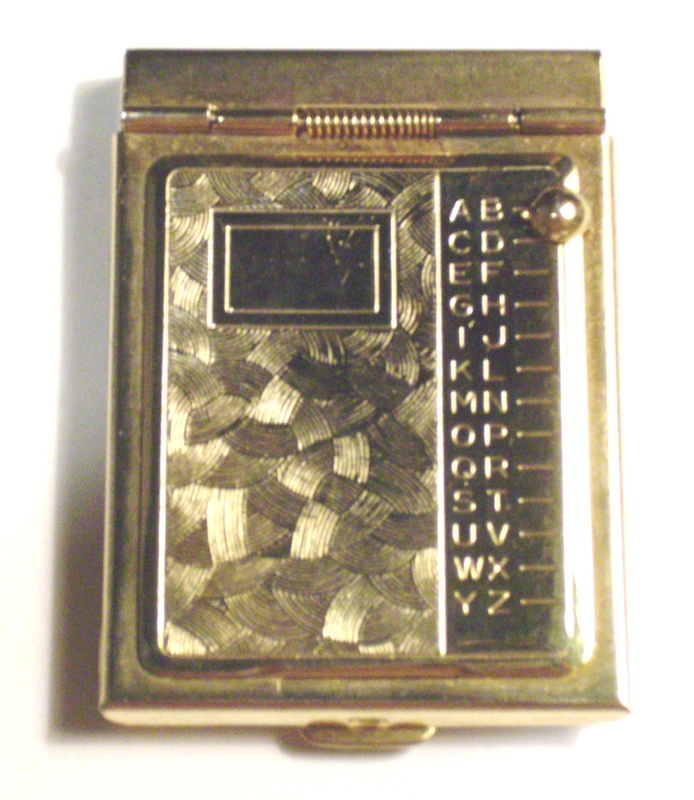 The button beside the letters slides up and down, and when I push the little cigarette case-like button on the bottom the book opens up to just that page. This little address-keeper has no scribbling in it whatsover, and a 1955 calendar on the back of each page. An unwanted gift, maybe, from a beau she didn’t love. Or the one who couldn’t buy her something better. His name might have been Roger, or Jim, or Richard – nothing dashing enough, really, for her to write in the little book. Maybe the gift was a disappointment, a decision made, not enough. After she left him outside the door, she may have tucked it away in a scarf drawer with the other almost-but-not-quite things from perfectly nice gentlemen who wore the wrong hats or didn’t quite manage to shine their shoes. Another trinket from a fellow working behind a counter instead of a desk. I’m sure he knew she was too good for him. He knew when she opened the box. And he was such a nice one, too. Awfully sweet. That’s why she didn’t have the heart to throw it away or fill it up with other men’s addresses. It’s a heavy guilt saying no to a worthy man who falls short in ways you’re ashamed to admit matter. But they did matter. It’s mine now – the address book and the story. Whether it’s true or not doesn’t matter – it’s true enough. “It’s a heavy guilt saying no to a worthy man who falls short in ways you’re ashamed to admit matter. But they did matter.” Gal, ain’t it the truth!! Or, as I’ve now stolen from you, tape it to the fridge.My grandmother used to have one of those sitting on her desk and I used to love to slide the little thing to the different letters of the alphabet and pop it open and look at all the names she had in it. Monda, you have to keep finding things like this. I’m always intrigued. Oh Candace! Those large address flip-thingies that sat by the phone were my favorite – and the next thing I’m on the lookout for right now. Well, that and about 47 other things. I’m. An. Addict.Whit – there are two or three more of these in various states of prettiness up for bid right now. They’re so tiny.